Longtime Hillary Clinton adviser Phillip Reines says the chances of Clinton running for president in 2020 are "not zero." "It’s somewhere between highly unlikely and zero," Reines told Politico in an article published Friday. "But it’s not zero." Reines was an adviser to Clinton's 2016 campaign and played the role of then-candidate Donald Trump during mock debates. Since Clinton's stunning defeat, Reines has continued to talk up his former boss and believes she should be included in the discussion as a possible 2020 candidate. "It’s curious why Hillary Clinton’s name isn’t in the mix—either conversationally or in formal polling—as a 2020 candidate," Reines said. "She’s younger than Donald Trump by a year. She’s younger than Joe Biden by four years. Is it that she’s run before? This would be Bernie Sanders’ second time, and Biden’s third time. Is it lack of support? She had 65 million people vote for her." He added that if Clinton lost half of the people who voted for her, she would still have a bigger base of support than Sen. Bernie Sanders (I., Vt.) or Sen. Elizabeth Warren (D., Mass.). Clinton has made headlines in recent weeks with her comments about civility and her husband's infidelity. Clinton commented how civility towards Republicans has to wait until after the November midterm elections and that one can't be civil with a political party that wants to "destroy" her party's values. She also denied that her husband, former President Bill Clinton, abused his power when he had a sexual relationship with White House intern Monica Lewinsky. Both comments came under scrutiny. Reines said blaming the 2016 defeat on her is an "oversimplification" and that she is better than most potential candidates. "Chalking the loss up to her being a failed candidate is an oversimplification," Reines said. "She is smarter than most, tougher than most, she could raise money easier than most, and it was an absolute fight to the death." 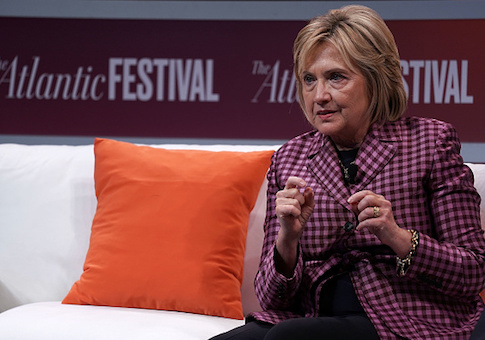 Clinton claimed last year she would not run for president again. This entry was posted in Politics and tagged 2020 Election, Hillary Clinton. Bookmark the permalink.